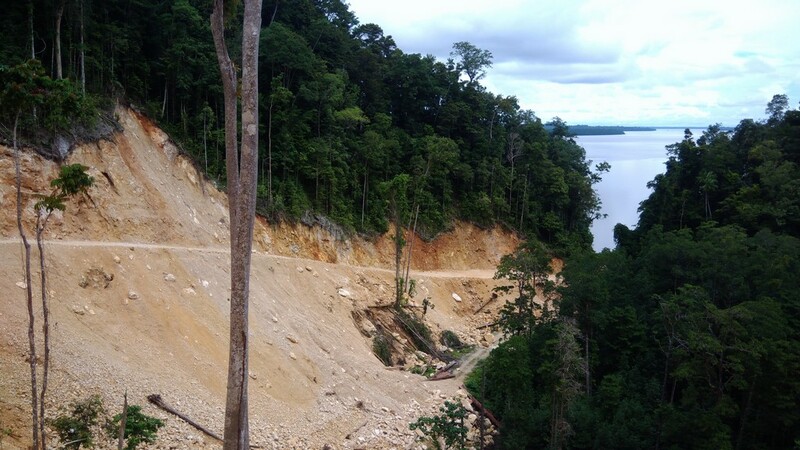 So far, we have been up 4 rivers in the West Papua region of Indonesia. West Papua is actually part of the large island of New Guinea, but the western half of New Guinea these days is owned by Indonesia. The largest city in the area is the town of Kaimana, which should show up on any map reference you search for. The first river we explored is listed on our CMap chart as the Tombona River. 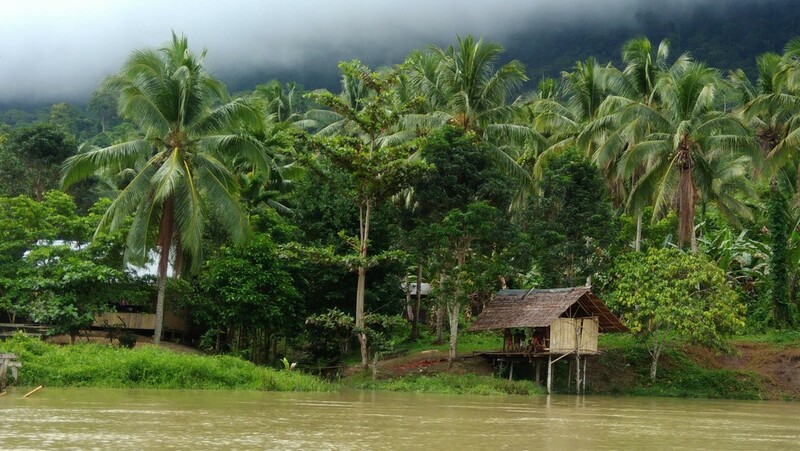 The river mouth is located at 03 45.76 S / 134 07.52 E, near the tiny town of Lobo. It is approximately 22 miles ESE of Kaimana, as the crow flies. The Tombona River exploration was an easy one for us. 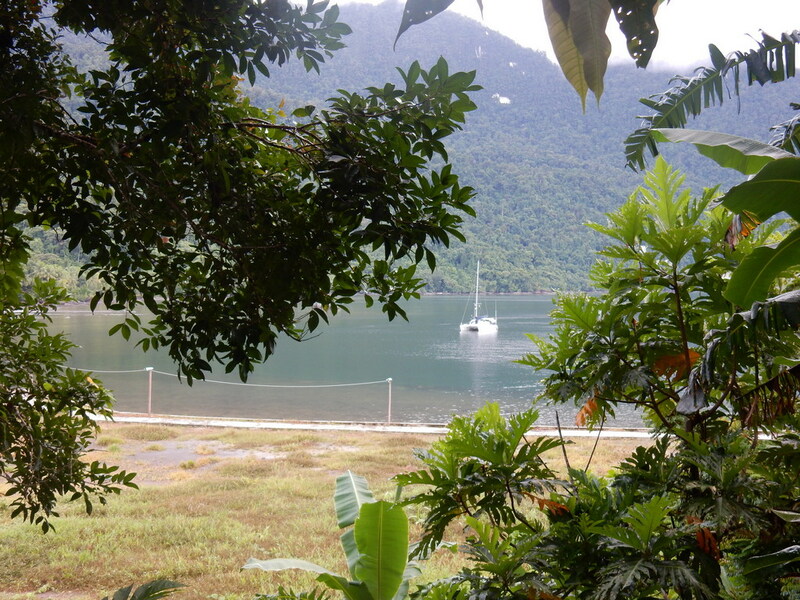 We were with our friends from s/v Ocelot, who had been up the river by dinghy 2 years previously. So we knew where to anchor the big boats to be near the mouth, and approximately how far up the river we could get by dinghy. 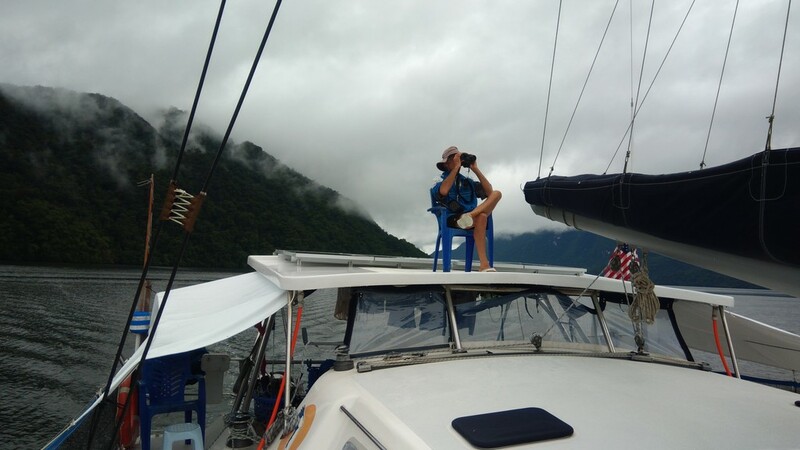 We anchored at 03 45.733 S / 134 06.944 E during the day, to be near the river mouth, but then moved to 03 46.157 S / 134 06.028 E before nightfall, to get a little more protection from the southerly winds. First anchorage was in only about 10 feet, and you must approach by coming in toward the town of Lobo along the western side of the bay, and then heading east toward the waypoint. There is a huge shallow delta straight off the river. Our nighttime anchorage was fairly deep (60 ft) but more sheltered than the shallower water off Lobo. Our CMap chart shows only the mouth of the river, with no depths. 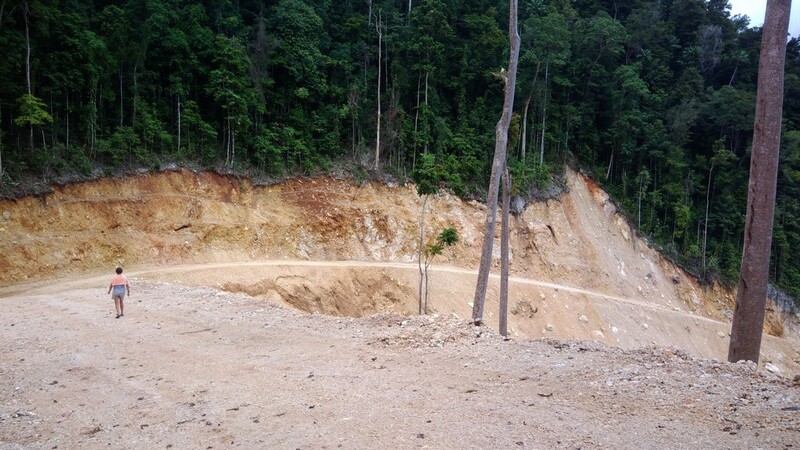 And, like most of West Papua, the chart location is offset nearly 1 mile to the west (or east?) of where it actually is. Fortunately, between Ocelot and ourselves, we had good high-resolution GoogleEarth charts of the river (thanks to GE2KAP). I loaded a set of GE charts on my smartphone running OpenCPN, and we grabbed our hand-held depth sounder, and off we went in the dinghies. The tide was pretty high at the time, so we had no troubles going in over "the bar". And in fact, we could have brought the big boats quite far up the river. The lowest depth we saw going over the bar at high tide was about 10 ft. On the way in, we saw a small settlement about a mile inside the river, with a new road being constructed, presumably going to the town of Lobo, nearby. There were a few huts placed on high spots along the river, and a few people watching the crazy "Bulay" (white people) going up the river in their funny boats. About 3 miles in, we finally reached the rapids that we had been told about. The water was high enough that we couldn't see any rocks, but we noticed some ripples on the water, and the current was running very fast against us. Sounding with the hand-held sounder revealed that we were in only 4 ft of water. 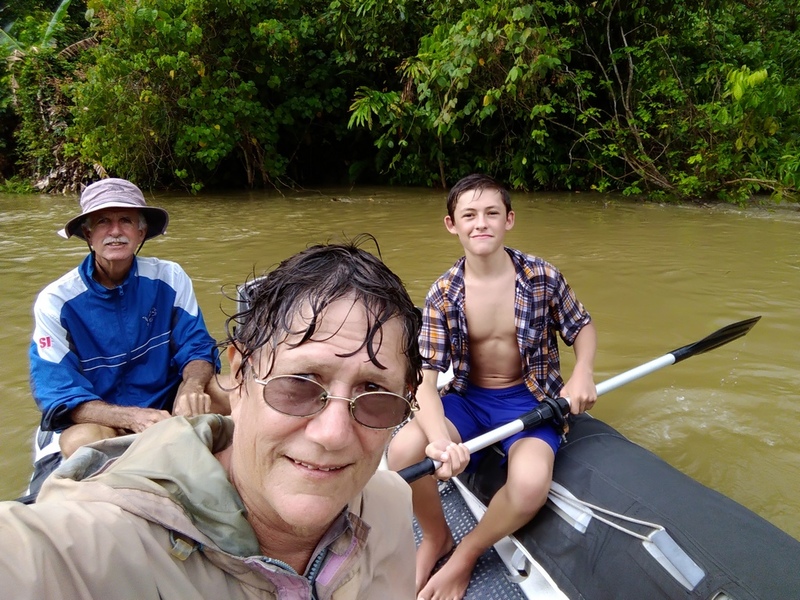 We didn't attempt going higher up the river--the water was running so fast that we'd need to plane with the dinghy, and we didn't want to be going that fast with unknown depths. So we turned our engines off and floated down with the current. We saw some kids hanging out on an over-water hut--but no one swimming--this is crocodile territory. 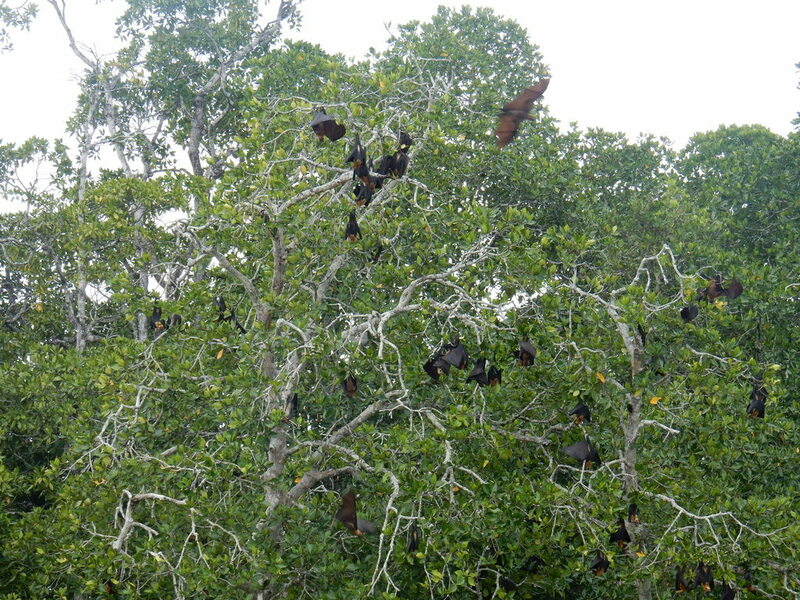 At another spot in the river there were several trees with a few fruit bats hanging in the trees. Once we got down toward the mouth of the river, the current slowed down, so we fired up the outboards and sped back down the rest of the river and back to the boats. Once we explored this river, Dave was hot to see some other rivers. 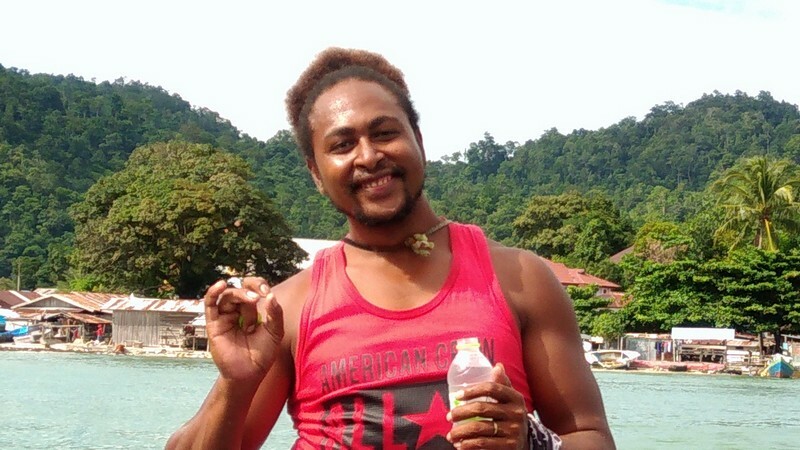 He queried Lisa from Triton Bay Divers about the big river to the east of Triton Bay. This is actually a system of rivers. We will call the whole river adventure the Lakahia River Basin, named for the Lakahia Bay which leads into the river system. Lisa told Dave that one of her boat drivers had grown up in that area, and she would ask him if he would guide us up the river. Well, Andreas said he would. However, Andreas's English was about as bad as our Indonesian, so we took Lisa along as interpreter for a several day trip up the river. We were fortunate that it was off-off season at Triton Bay Divers, and Lisa felt she could get away for a few days. We could have spent a week or two gunkholing up in the Lakahia River System, but since Lisa and Andreas could only get away for 3 days, we did the whole trip in 3 days. 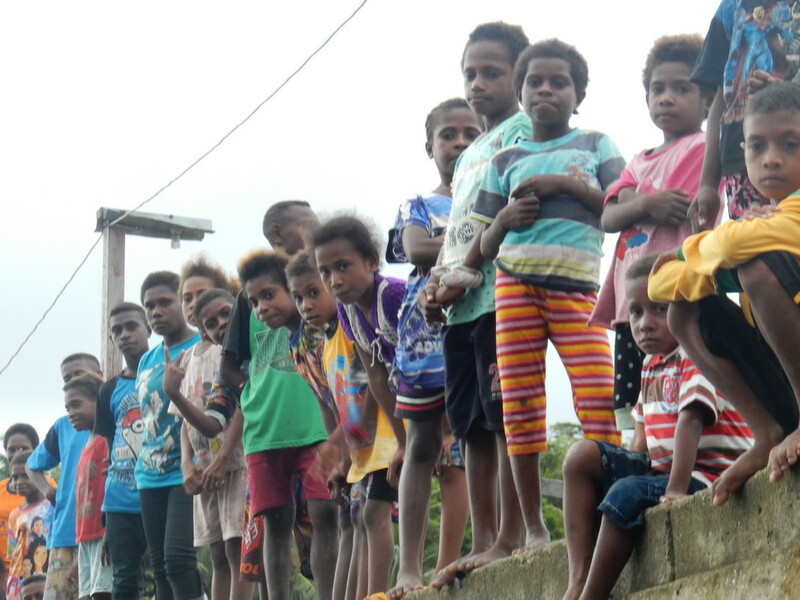 Day 1 we made our way from Triton Bay Divers to the mouth of the river, where Andreas's family still lives. 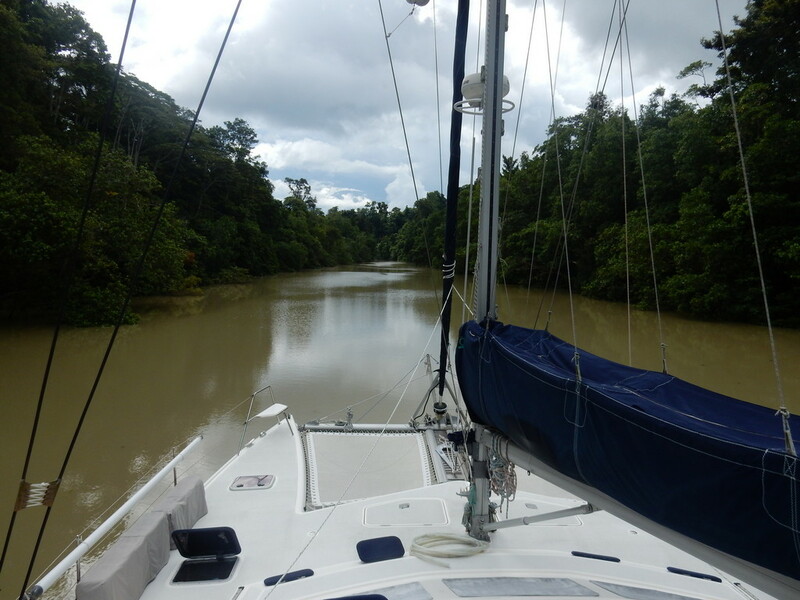 Day 2 was up the river to the very end, and then back a little to anchor in a tributary off the main river. Day 3 was back out the river and back to Triton Bay Divers. With Andreas assuring us that the river was deep enough, and providing guidance in a few places, we made it 35 miles up the river, to the very end. 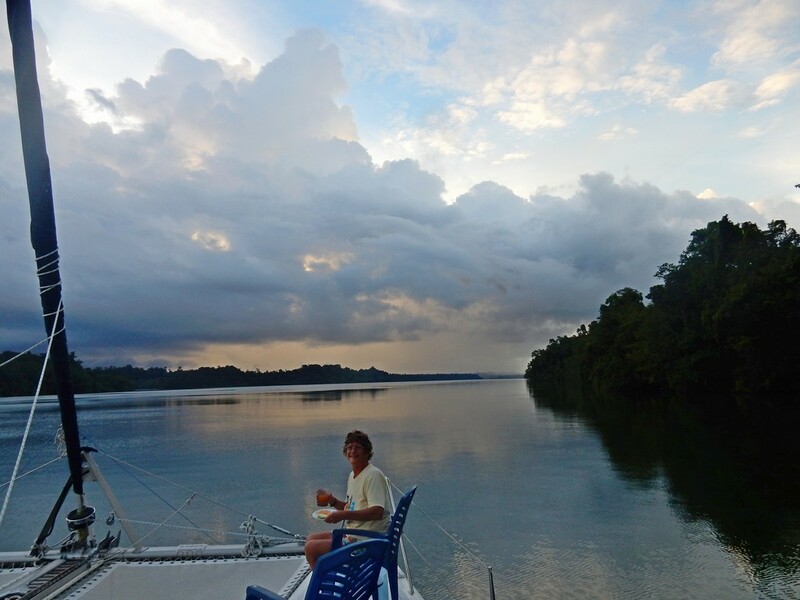 Andreas spent the whole night up looking for crocodiles when we anchored overnight in a tributary. Unfortunately we never saw a crocodile. But Andreas regaled us with a tale of a 27-ft crocodile that men from his village saw when he was growing up. (The official world record is 24 ft, but in order for it to be an official record, you have to measure the beast from tip to tail. Try doing that from a dugout canoe with a 27 foot crocodile!). We did see the White Dolphins that Andreas had told us about. After we dropped Lisa and Andreas back at Triton Bay Divers, we said goodbye to all our friends at Triton Bay, and headed out for another visa renewal in Tual. 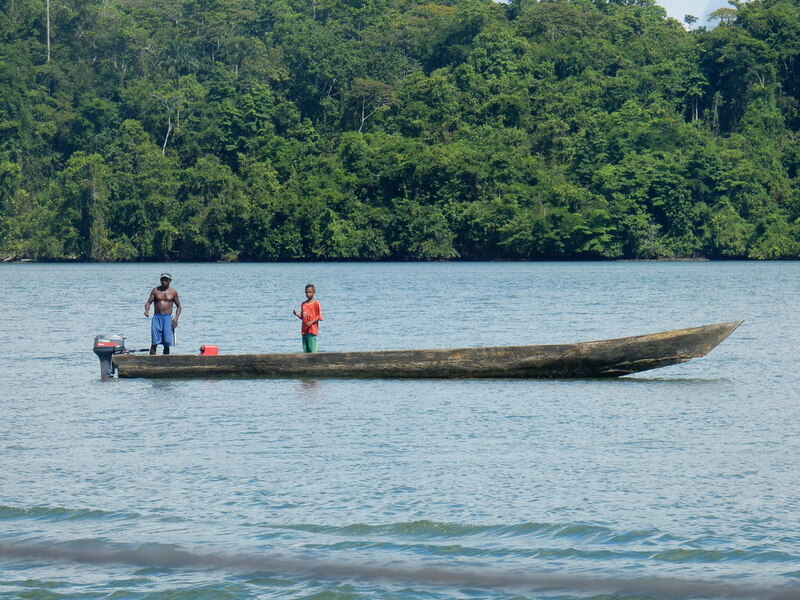 On our return to the Triton Bay area, we first dropped anchor at the NW tip of Aiduma Island. This is a great late/night arrival bay, as most of the bay is free of coral reefs, and the water shallows slowly to a nice sandy bottom. Our favorite anchor spot was 04 09.694 S / 133 20.6412 E. There are two small fishing camps at either end of the bay, but in the three times we anchored there, we were never bothered by anyone. The next day, we set out to see the 3rd river, the Karufa River. For some reason, other than a small village outside the mouth of the river, we saw no signs of habitation at all up this river. We spent 2 nights on the river, and went as far up the river as we could get. We still had 8 ft of depth when we turned around, but the river was getting so narrow we feared we would have trouble turning around. 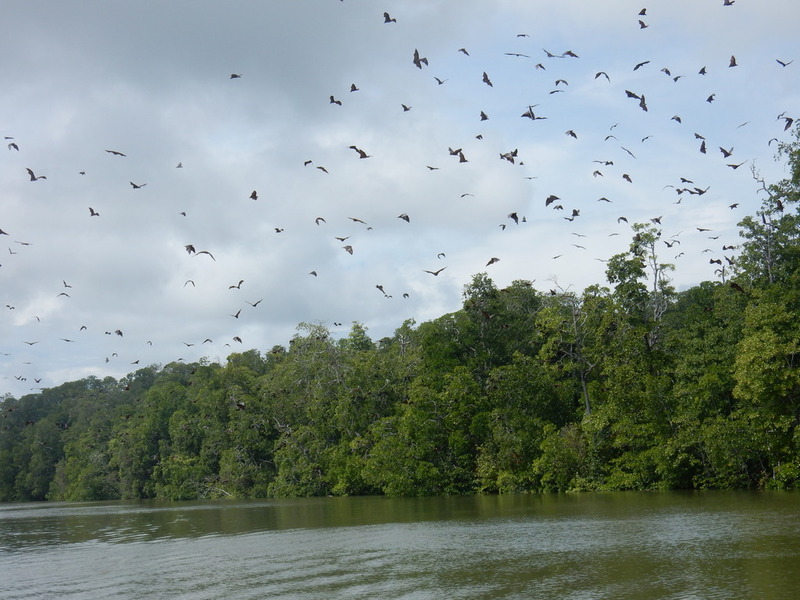 There wasn't much to see up this river except lots and lots of fruit bats. 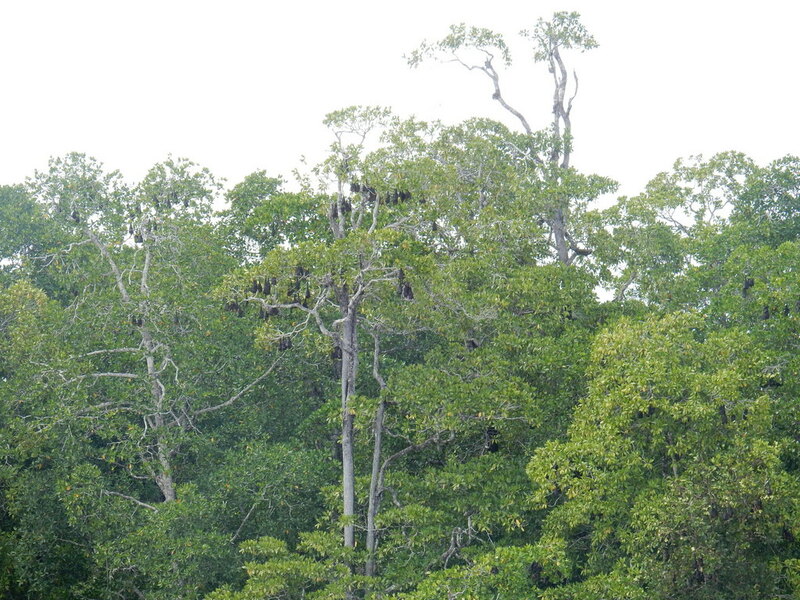 There was a half mile stretch of river in which both sides of the river was lined with trees that were black with bats. We could hear the bats before we saw them--screeching and chittering in the trees, and then flying off in a big cloud when we got close. We opted to make our way a little further down the river for our second overnight. 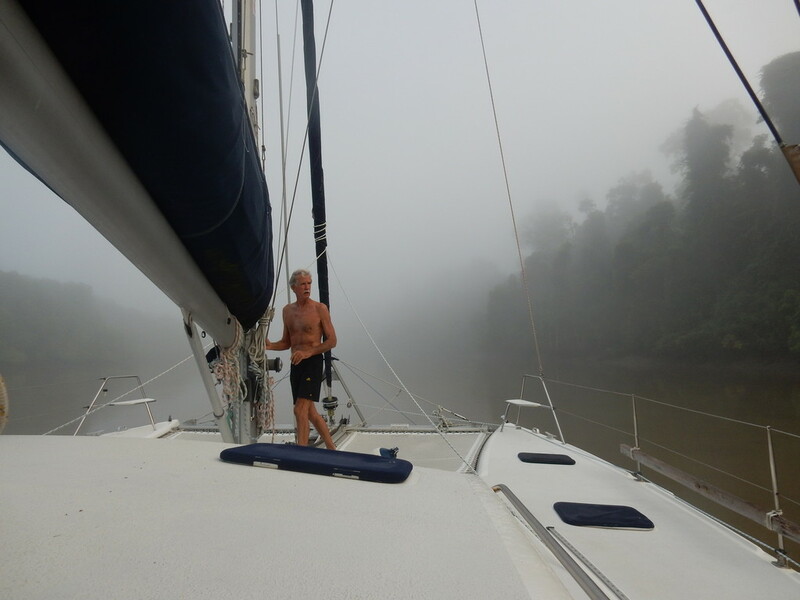 On the morning of our last day on the Karufa River, we were surprised to wake up to a heavy fog. 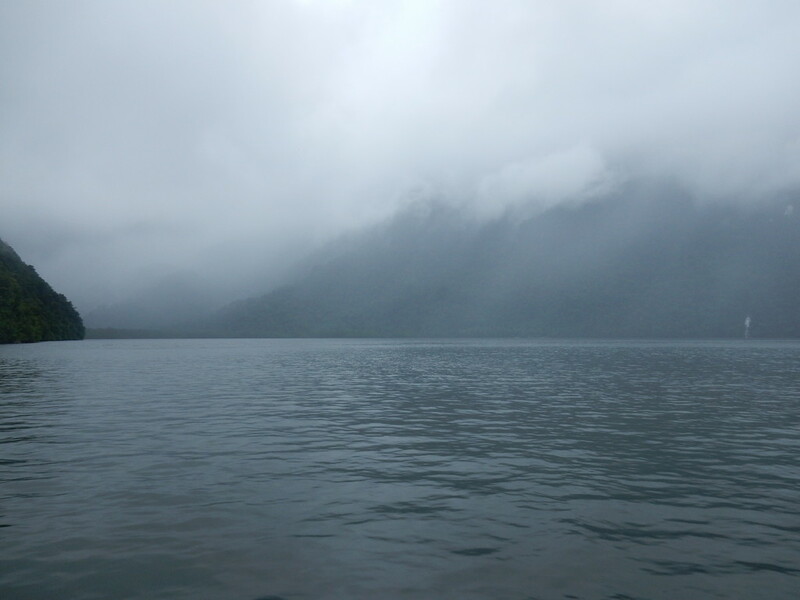 We were anchored in a fairly narrow part of the river, but we could barely see the shore on either side. We had a long way to go that day, so we couldn't wait around for the fog to burn off. So we crept south down the river with a lookout on the bow. The fog soon burned off. 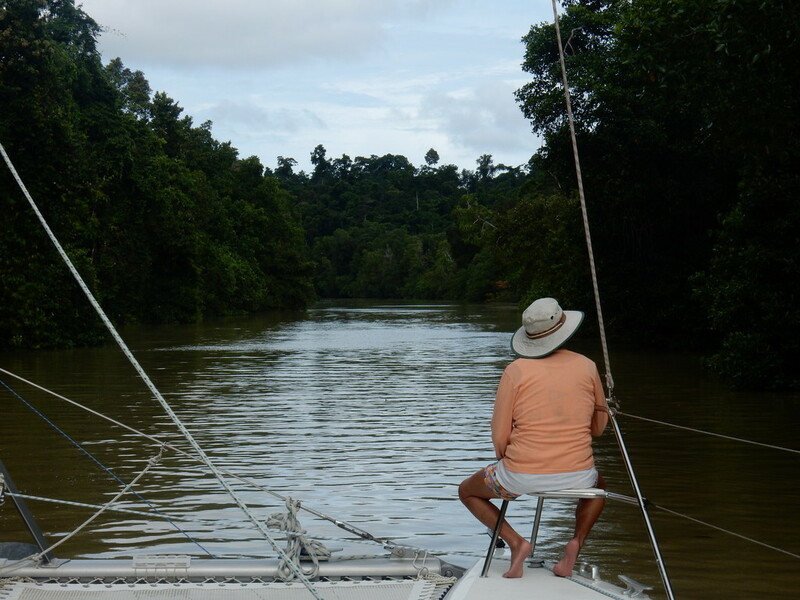 Once out of the river, we headed for Kaimana, just to see the place. 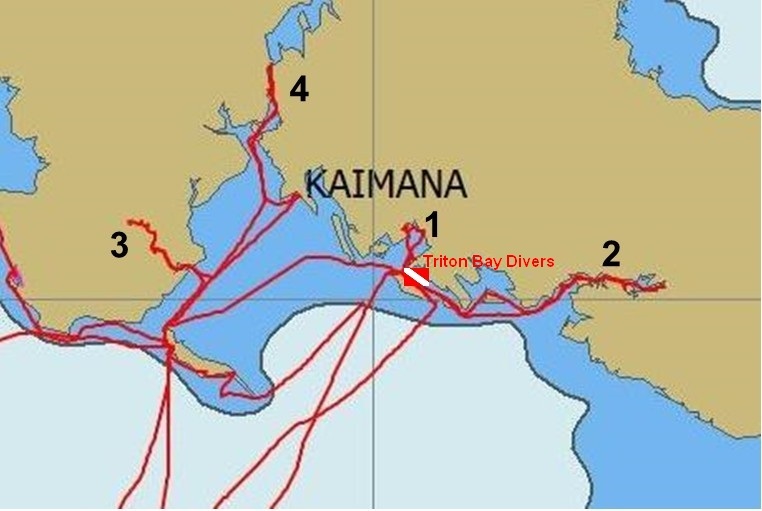 I had an opportunity when we were hanging out off Triton Bay Divers, to go in to Kaimana with the TBD supply boat one day. But Dave had never been there. Our friends on Ocelot were not real fond of the place as a cruising stop. There is no real good place to put your dinghy--the locals use a very sharp rocky seawall, or a beach that slopes gradually for 100 yards at low tide. The town is really spread out, with the market a long way from the main part of town. 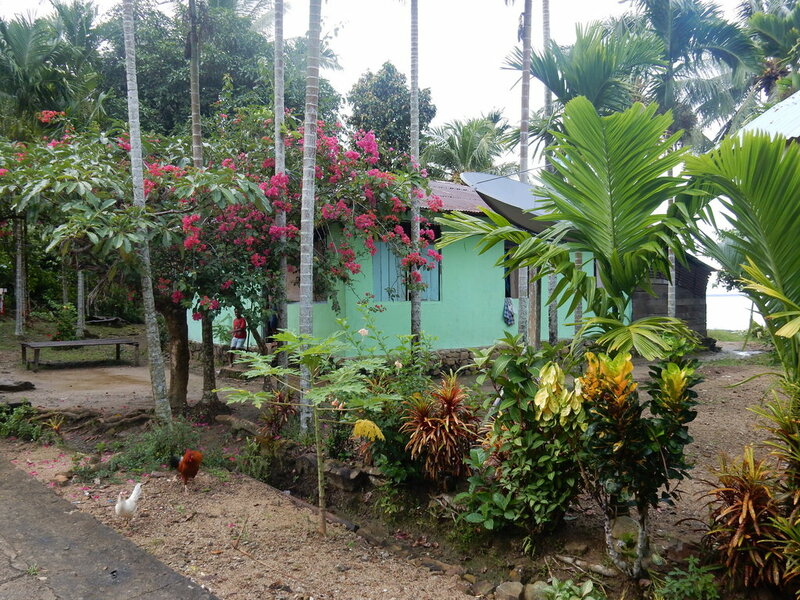 But there is an ATM, a pretty good cell signal, and a fairly decent fresh market. 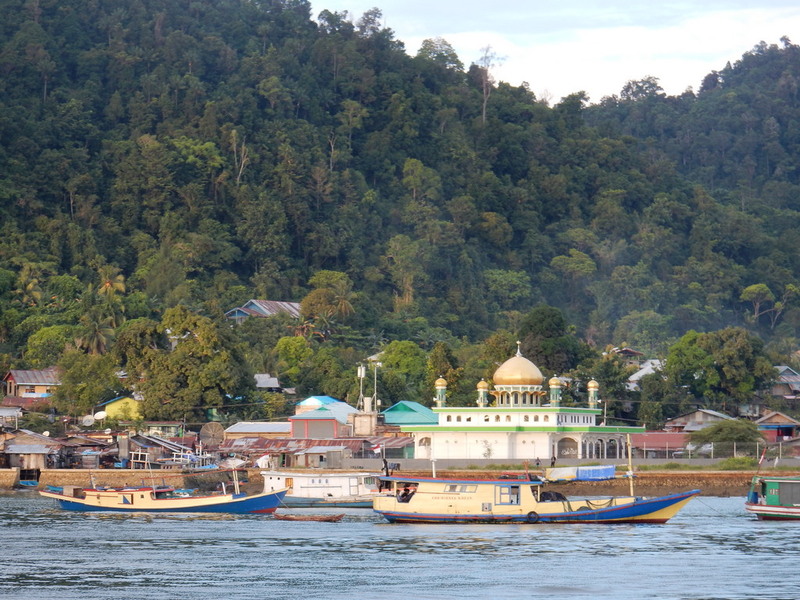 We couldn't figure out why there were so many fishing boats in port, until we realized that today (June 25) was Eid al-Fitr (aka Idul Fitri), the day that signals the end of Ramadan. Ramadan is the month of prayer and fasting for Muslims. Most Muslims in Indonesia fast from sunrise to sunset every day for the entire month of Ramadan. So the end of Ramadan, the end of getting up really early to eat and then starving yourself all day, is a BIG DEAL, with lots of feasting and partying. With no good place to leave the dinghy, we enjoyed watching the end of Ramadan festivities from our cockpit. Fireworks, singing, and a parade of cars all decorated. Since we had just provisioned heavily in Tual less than a week before, we didn't really need anything ashore. So after catching up on email with the 4G data in Kaimana, the next day we left to see our 4th and final river. Again we're not sure of the proper local name for the river, and again it is complicated in that several rivers merge into one bay. Unlike the Karufa River, this bay had a number of villages indicated on the various charts we had, and visible on GoogleEarth. We also could see a road running from Kaimana along the east side of the river. We spent 3 nights poking around in the lower half of the river. Finding a good anchorage was complicated by the great depths of the river, but also because of a fairly strong current. 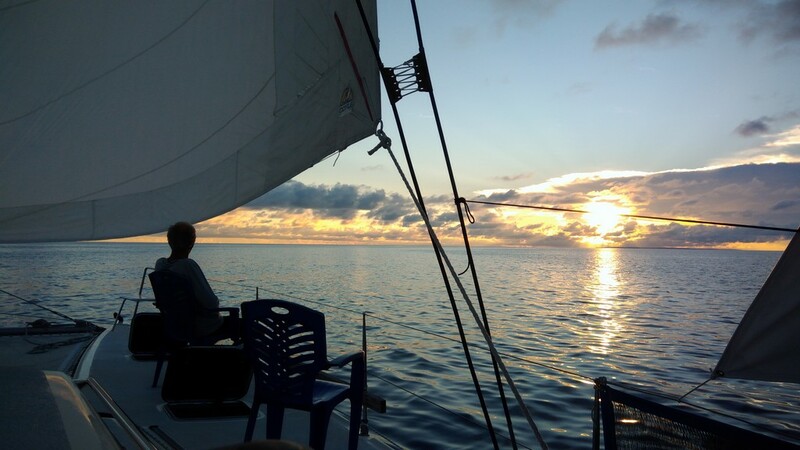 The first night we anchored, we did some exploring ashore along the road to Kaimana. 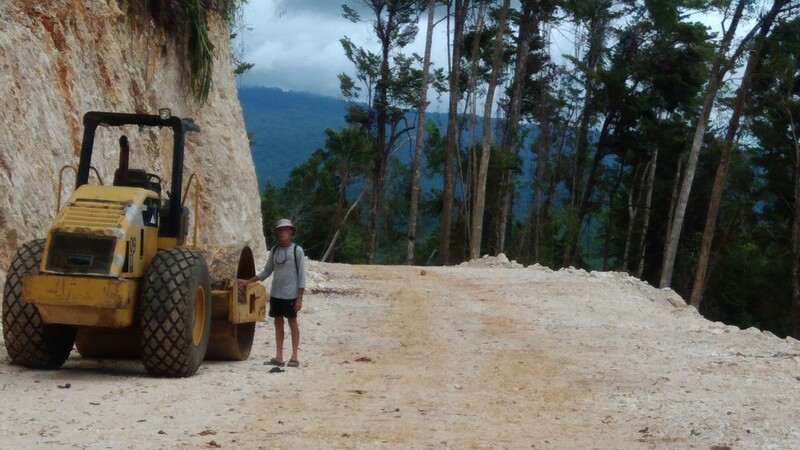 We could see signs of a massive road construction project. We only got halfway up this river. We had planned to go further up the river than we did, but the increasing current as the river narrowed, plus the increasing signs of habitation, caused us to turn around before we reached the very end. 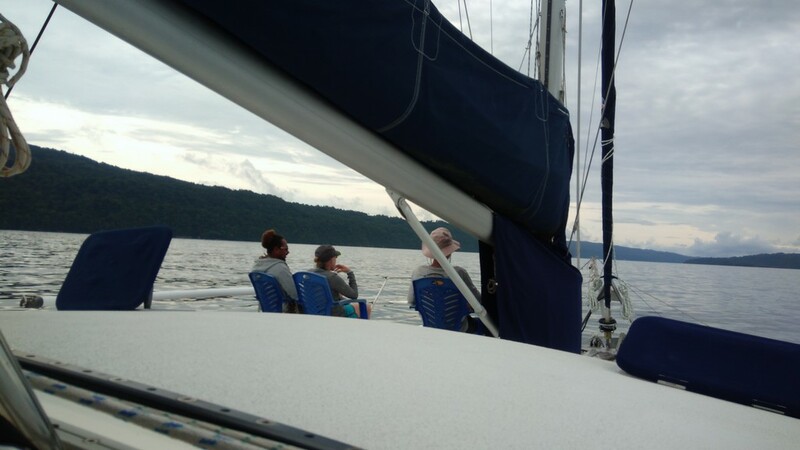 As we slowly motored into the 3-4 knot current, we could see into the upper part of the river, and were shocked to see lots of boat traffic. Not an upriver wilderness adventure at all! So we turned around and shot back down the river with the current. As we came out of the Kamrau, we for once had a good wind behind us, and made great time heading west. We made it all the way out to Blumpot Bay again, just before sunset. This positioned us in a good place to leave early the next morning for the long leg to our next destination--a waterfall you can anchor next to!